1. Increase Your Knowledge and Skills. This training spotlight uses the CDC framework as a conceptual model to organize learning opportunities. 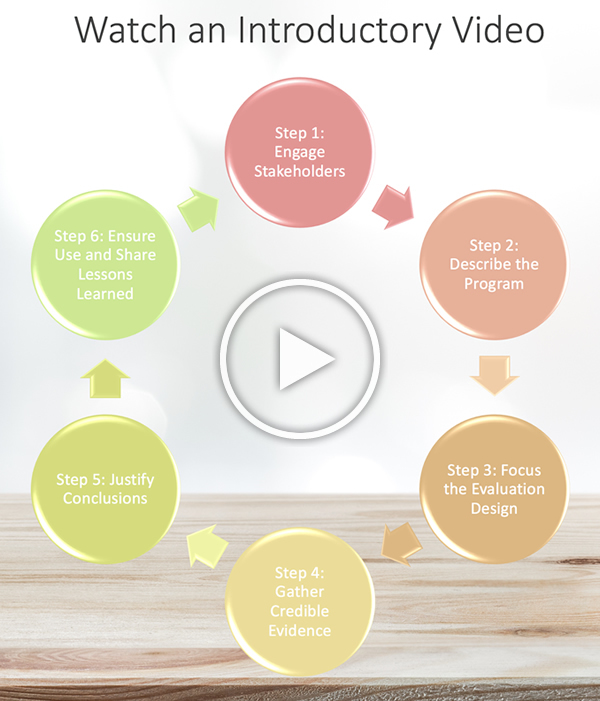 It presents introductions to the six steps of program evaluation in short video podcasts. You can also download materials from the CDC about each step. After reviewing the introductory material, you can access additional learning opportunities to gain knowledge and skills related to each step of the framework. 2. Translate Knowledge to Practice. 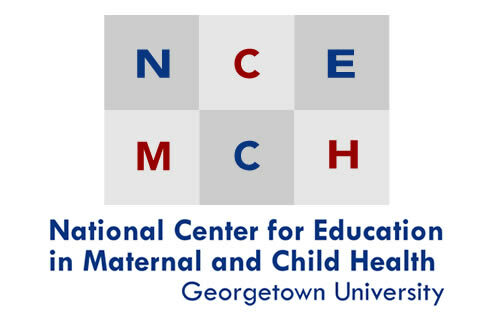 This spotlight also includes an Evaluation Toolkit developed by NCEMCH that includes an evaluation primer, a collection of key resources, and an interactive Choose-and-Use tool to assist users in finding instructions on how to conduct evaluations and examples of successful evaluations from the field. Maximizing Community Stakeholders' Engagement. Date Developed: Unknown. Source: Citymatch. Presenter(s): Tom Wolff, PhD. Type: Narrated Slide Presentation. Level: n.a.. Length: 35 minutes. Engaging Partners for the Transformation of the MCH Block Grant. Date Developed: March 4, 2017. Source: AMCHP. Presenter(s): Nora Carswell, BBA; Michele Lawler, MS, RD; Michael Spencer, LGSW, MSW. Type: Video Conference Presentation. Level: Introductory. Length: 115 minutes. Hallways to Health Sustainability Planning: Engaging Stakeholders. Date Developed: March 29, 2017. Source: School-Based Health Alliance. Presenter(s): Unknown. Type: Webinar. Level: Introductory. Length: 31 minutes. How Purpose, User and Use Frame Evaluation Choices. Date Developed: Unknown. Source: CDC. Presenter(s): Thomas J Chapel, MA, MBA. Type: Webinar. Level: Introductory. Length: 50 minutes. Top Roadblocks on the Path to Good Evaluation – And How to Avoid Them. Date Developed: Unknown. Source: CDC. Presenter(s): Thomas J Chapel, MA, MBA. Type: Webinar. Level: Introductory. Length: 25 minutes. Writing SMART Goals and Objectives. Date Developed: March 30, 2011. Source: Capacity for Health. Presenter(s): Sonya Dublin. Type: Webinar. Level: Introductory. Length: 60 minutes. Logic Models for Evaluation Planning. Date Developed: September 25, 2012. Source: Capacity for Health. Presenter(s): Lyn Paleo, MPA, DrPH. Type: Webinar. Level: Introductory. Length: 58 minutes. Developing Logic Models for Program Design and Evaluation. Date Developed: March 27, 2014. Source: Urban Indian Health Institute. Presenter(s): Unknown. Type: Webinar. Level: Introductory. Length: 32 minutes. Program Evaluation, Improvement: Understanding Needs Assessments. Date Developed: December 17, 2015. Source: Defense Centers of Excellence. Presenter(s): Capt. Armen H Thoumaian, PhD, USPHS; Carter Frank, MA, MS; S. Hope Gilbert, PhD; Debra Stark, MBA; Susanne Meehan, BA. Type: Webinar. Level: Introductory. Length: 45 minutes. Enhancing Program Performance with Logic Models. Date Developed: Unknown. Source: University of Wisconsin-Extension. Presenter(s): N/A Type: Online Course. Level: Introductory. Length: Self-paced. Describing Your Program and Choosing an Evaluation Focus. Date Developed: Unknown. Source: CDC. Presenter(s): Thomas J Chapel, MA, MBA. Type: Webinar. Level: Introductory. Length: 60 minutes. Developing Good Evaluation Questions. Date Developed: April 23, 2014. Source: USAID Learning Lab. Presenter(s): Unknown. Type: Webinar. Level: Introductory. Length: Unknown. Program Evaluation: Basic Data Analysis. Date Developed: January 25, 2012. Source: Capacity for Health. Presenter(s): Jessica Manta-Meyer. Type: Webinar. Level: Introductory. Length: 64 minutes. Intermediate Data Management and Analysis. Date Developed: May 2, 2012. Source: Capacity for Health. Presenter(s): Jessica Manta-Meyer. Type: Webinar. Level: Intermediate. Length: 55 minutes. Focusing Evaluation Design. Date Developed: March 27, 2014. Source: Urban Indian Health Institute. Presenter(s): Julie Loughran, MPH. Type: Webinar. Level: Introductory. Length: 30 minutes. Thinking About Design. Date Developed: Unknown. Source: CDC. Presenter(s): Thomas J Chapel, MA, MBA. Type: Webinar. Level: Introductory. Length: 15 minutes. Improving Public Health Data Dissemination through Policy and Tools. Date Developed: June 24, 2016. Source: National Association of Health Data Organizations. Presenter(s): Barbara Rudolph, PhD, MSSW. Type: Webinar. Level: Introductory. Length: 65 minutes. Data Collection in Program Evaluation: How to Ensure Quality and Security. Date Developed: May 17, 2015. Source: Defense Centers of Excellence. Presenter(s): Capt. Armen H Thoumaian, PhD, USPHS; Jill Goodwin, PsyD; Toby Canning, PhD; Carter Frank, MA, MS; Susanne Meehan, BS. Type: Webinar. Level: Introductory. Length: 49 minutes. Approaches to Collecting and Using Social Determinants of Health Data. Date Developed: June 23, 2016. Source: All In: Data for Community Health. Presenter(s): Peter Eckart, AM; Alison Rein, MS; Andrew Hamilton, RN, BSN, MS; Michelle Lyn, MBA, MHA. Type: Webinar. Level: Introductory. Length: 60 minutes. Using Mixed Methods to Evaluation Interventions. Date Developed: June 14, 2016. Source: International Institute for Qualitative Methodology. Presenter(s): Souraya Sidani. Type: Webinar. Level: Introductory. Length: 55 minutes. Mixed Methods in Health Sciences: Applications and Challenges. Date Developed: August 11, 2016. Source: International Institute for Qualitative Methodology. Presenter(s): Leslie Curry. Type: Webinar. Level: Introductory. Length: 58 minutes. Data Collection Choices. Date Developed: Unknown. Source: CDC. Presenter(s): Tom Chapel. Type: Webinar. Level: Introductory. Length: 22 minutes. Mixed Methods in Program Evaluation. Date Developed: Unknown. Source: CDC. Presenter(s): Tom Chapel. Type: Webinar. Level: Introductory. Length: 22 minutes. Introduction to Analyzing Evaluation Data. Date Developed: June 23, 2016. Source: Urban Indian Health Institute. Presenter(s): Jami Bartgis, PhD. Type: Webinar. Level: Introductory. Length: 66 minutes. Program Evaluation Can Help You Achieve Outcomes: Empowerment Evaluation. Date Developed: August 16, 2016. Source: Defense Centers of Excellence. Presenter(s): Abraham Wandersman. Type: Webinar. Level: Introductory. Length: 50 minutes. Data Analysis and Interpretation: Be Sure You’re Right, Then Go Ahead. Date Developed: January 11, 2017. Source: NIH. Presenter(s): John Ioannidis, MD, DSc. Type: Webinar. Level: Intermediate. Length: 58 minutes. Basic Data Analysis. Date Developed: April 18, 2012. Source: Capacity for Health. Presenter(s): Jessica Manta-Meyer. Type: Webinar. Level: Introductory. Length: 64 minutes. Fundamentals of Qualitative Research Methods. Date Developed: June 23, 2015. Source: Yale Global Health Leadership Institute. Presenter(s): Leslie Curry PhD, MPH. Type: Webinar. Level: Introductory. Length: 17 minutes. Ensuring use and sharing lessons learned occurs with these steps: design, preparation, feedback, follow-up and dissemination. For additional details, see the CDC factsheet on Ensuring Use and Sharing Lessons Learned as well as a checklist of items to consider when developing evaluation reports. Making Healthcare Data Actionable: Converting Data into Information for More Effective Reporting, Decision Making and Strategic Planning. Date Developed: January 14, 2016. Source: Health Management Associates. Presenter(s): Abraham Wandersman. Type: Webinar. Level: Introductory. Length: 27 minutes. Use of Impact Evaluation Results. Date Developed: November 20, 2012. Source: InterAction. Presenter(s): David Bonbright. Type: Webinar. Level: Introductory. Length: 61 minutes. Using Evaluation for Improvement: Assessing and Building Capacity. Date Developed: March 3, 2015. Source: EngageNY. Presenter(s): Unknown. Type: Webinar. Level: Introductory. Length: 65 minutes. This video presentation talks about various evaluation methodologies and how they have been applied in real-world settings. An Evaluation Primer that explains the basics of public health evaluations. A list of Key Resources for use in the development of evaluations. A Choose and Use Guide for quickly accessing current evaluations and guides for use as promising practices. 1 Koplan, Jeffrey P., Robert L. Milstein, and S. Wetterhall. "Framework for program evaluation in public health." Atlanta, Georgia. : US. Department of Health & Human Services (1999).